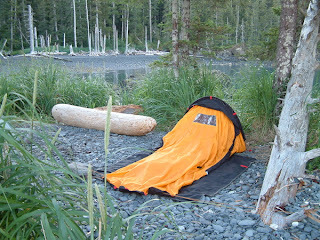 When you're camping from your kayak, take as little as you think you can comfortably manage with. The less you have with you, the quicker it is to find things and the less effort you'll need loading, unloading, carrying and setting up. That doesn't mean you have to forego taking your water-color paints! But really, how many changes of clothing do you really need? 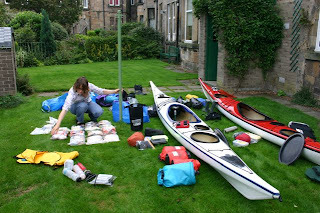 I'm not sure if the photo of us packing is an example of how-to-do-it or how-NOT-to-do-it! I'm serious. This is the first time we've done an extended paddle trip. Hi Mark, since I discovered merino wool my boat is a lot lighter. 1 pair of trousers, 2 pairs merino pants, 1 merino t shirt, 2 pairs merino socks, 1 pertex smock and no one complained after a week on Mull!